Genus of sand flies that vector Leishmania in Europe, Africa, and Asia. Lutzomyia feeding on a spiny lizard (Sceloporus sp.). Lutzomyia is a vector for Leishmania spp. and vesicular stomatitis virus in the Americas. 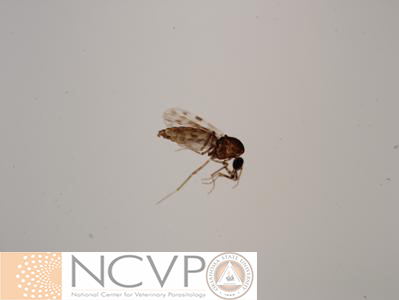 Because of their small size, Culicoides or biting midges are often called no-see-ums. Even so, they have a painful bite, causing considerable annoyance to human and animal hosts. Horses often become allergic to the bites. Culicoides sp. also serve as a vector of bluetongue virus. Sweet itch, Queensland itch, seasonal recurrent dermatitis, and summer itch are all common names for a condition in horses caused by hypersensitivity to the saliva of Culicoides sp. 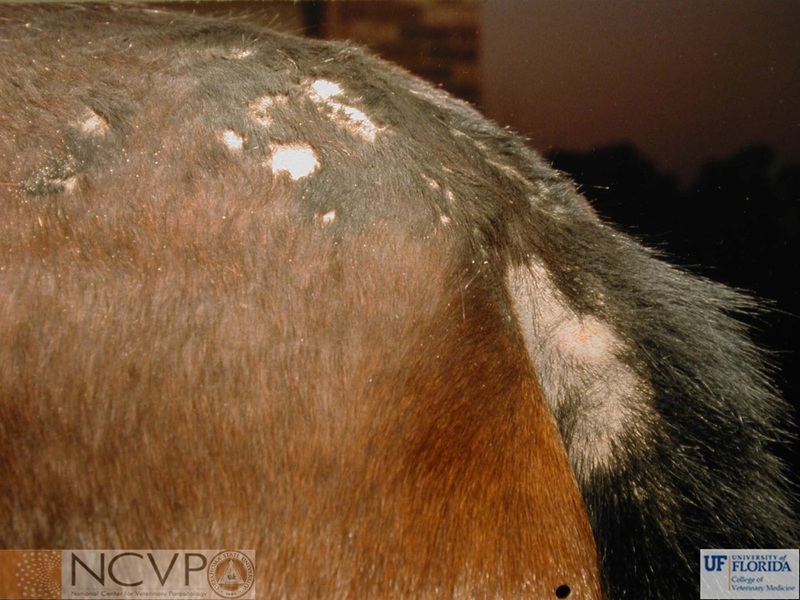 Common affected areas include the tail head, mane, ears, and ventrum. 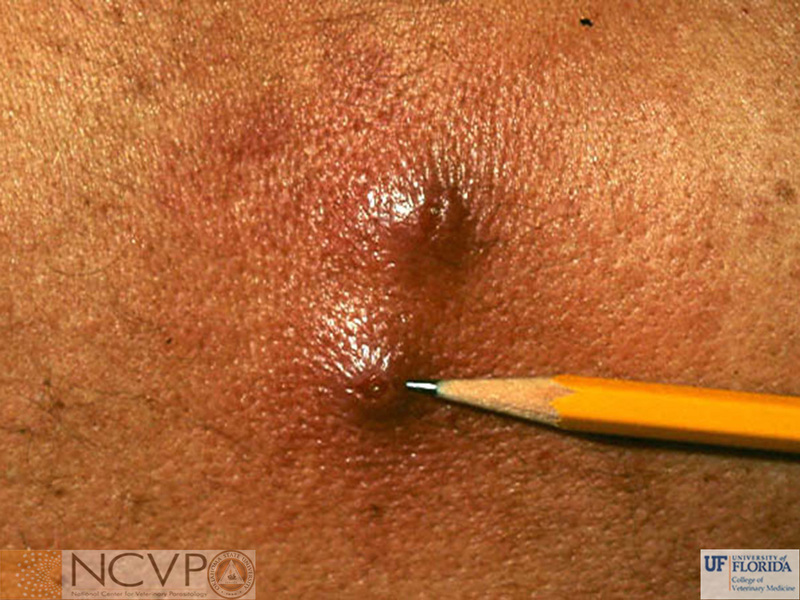 Alopecia occurs secondary to pruritus. 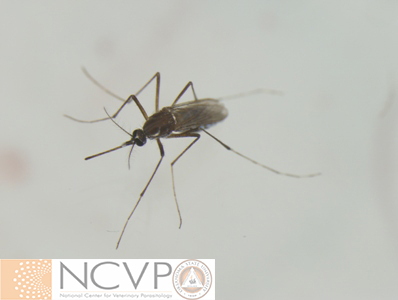 Aedes mosquitoes are important vectors of heartworm (Dirofilaria immitis) and several viruses important in veterinary medicine and public health. 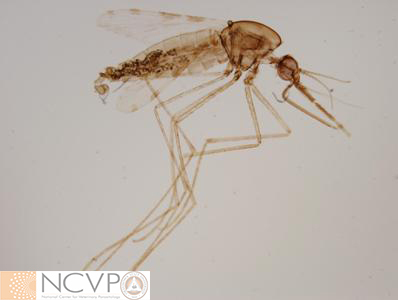 Anopheles are important vectors of human malaria throughout the world. 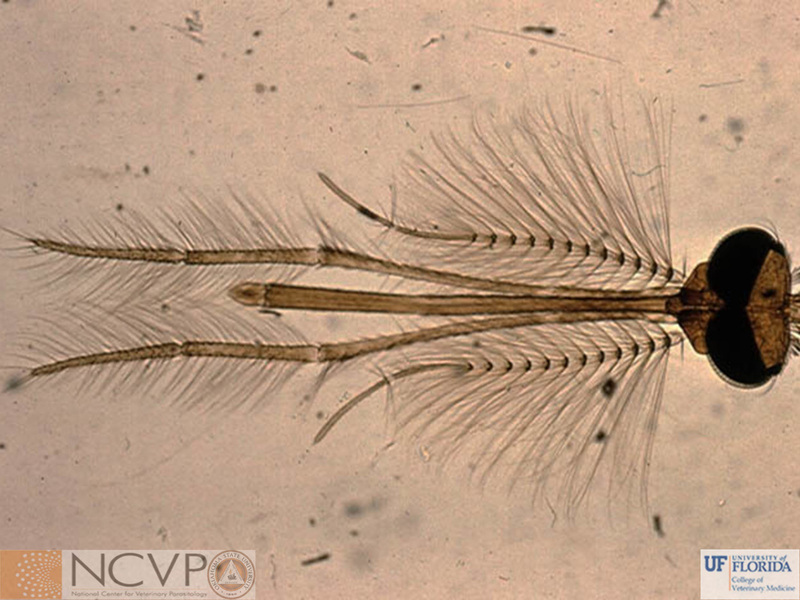 Magnified view of the head of a male culicine mosquito. Culex is an important vector of many diseases including West Nile virus and avian malaria. Dorsal view of the horn fly. 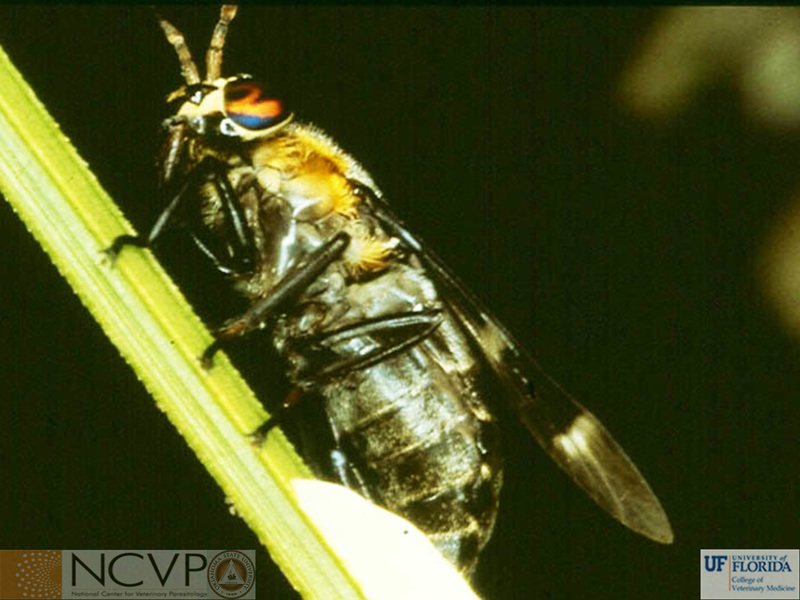 The majority of a horn fly's adult life is spent on its host, leaving only briefly to oviposit in fresh manure piles. Adults of Musca autumnalis, an important vector for pink eye (Moraxella bovis) and Thelazia sp., feeding on the eye secretions of a cow. Their preferential feeding habit is the basis for the common name, 'face fly'. 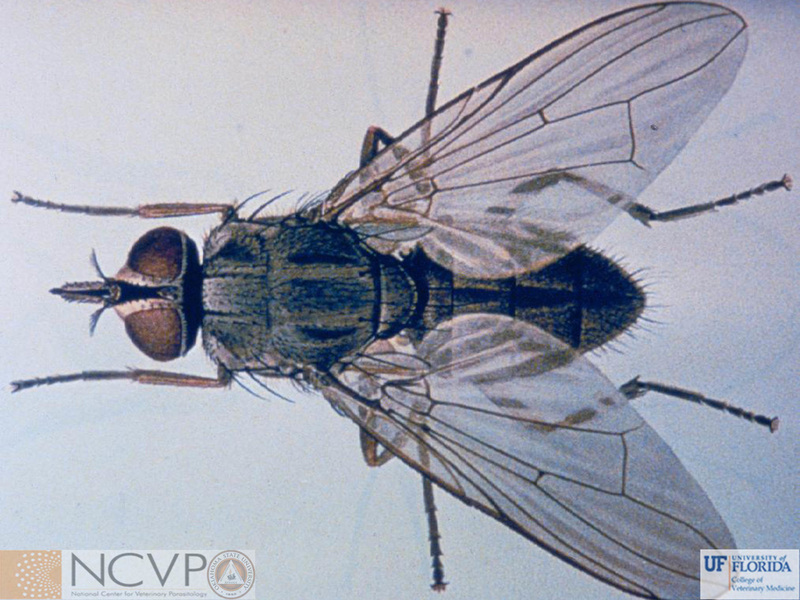 The common house fly, Musca domestica, is a mechanical vector of many infections and is a biological vector for Draschia megastoma and Habronema muscae. Four black stripes along the thorax of this fly aid in identification. 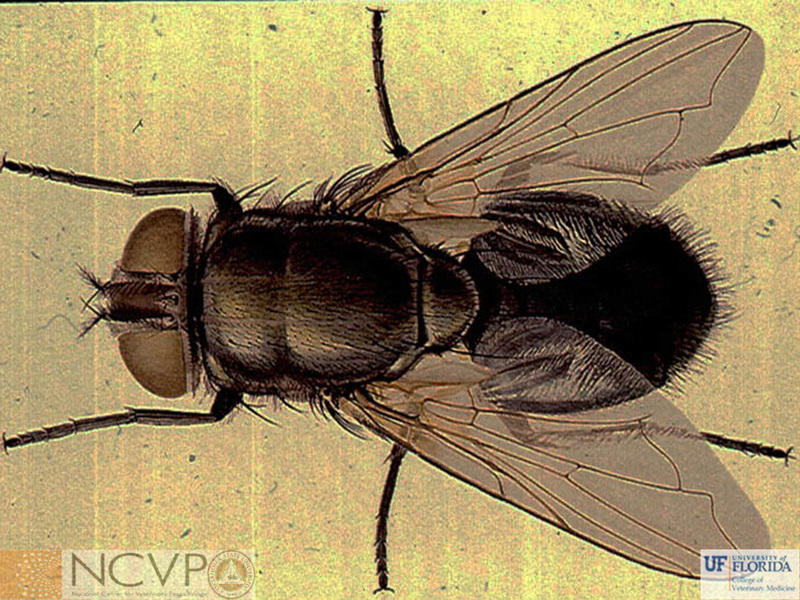 The stable fly is distinguished from other parasitic flies by its emarginated eye and distinct proboscis which projects forward. 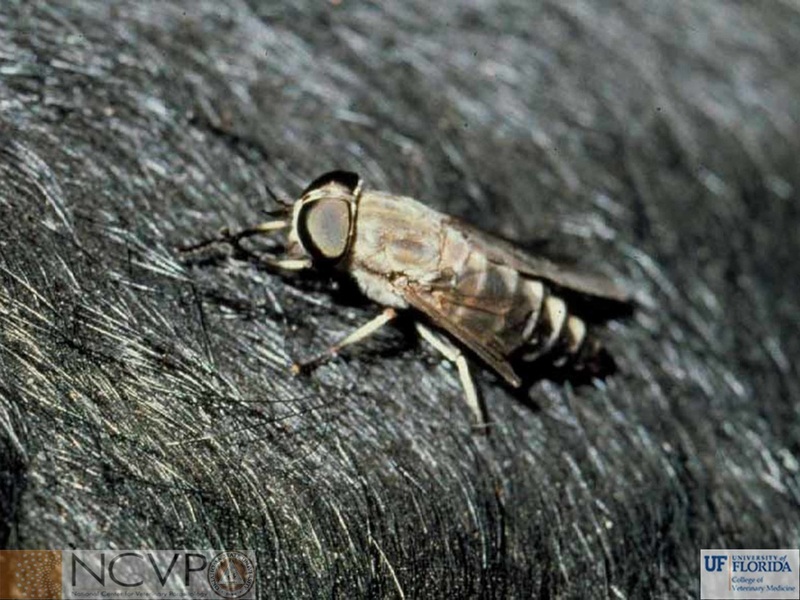 Although usually associated with cattle and horses, this fly may occasionally be found feeding on dogs and is also known as the dog fly or kennel fly. Adult Stomoxys calcitrans prefer to feed on the distal limbs of cattle. However, most of their time as adults is spent elsewhere in the environment and they reproduce in piles of decaying organic matter. A member of the family Tabanidae, Hybomitra hinei has been recorded as one of the fastest flying insects with a reported rate of 145 km/h. It has been proposed that Tabanids use polarized light to orient themselves and thus are active only during daylight hours. 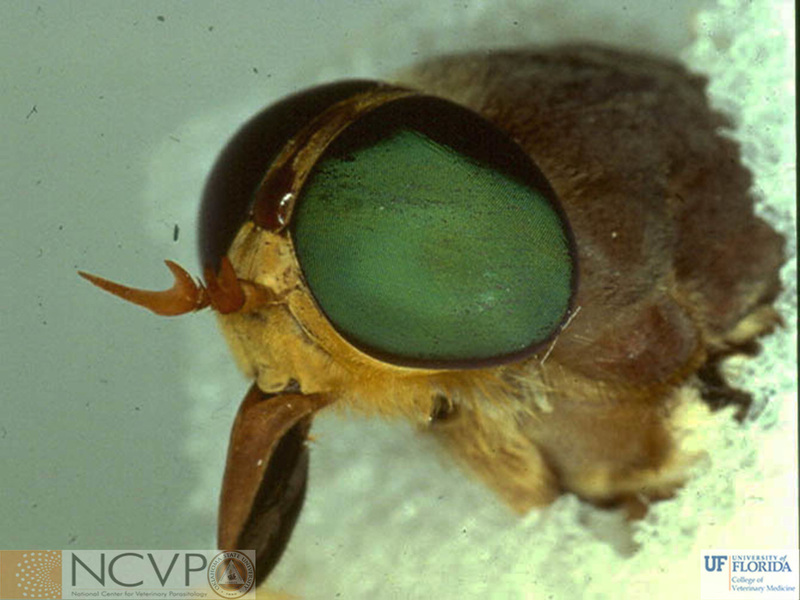 A member of the family Tabanidae, the genus Tabanus americanum may be distinguished from other horse flies by its antennae. 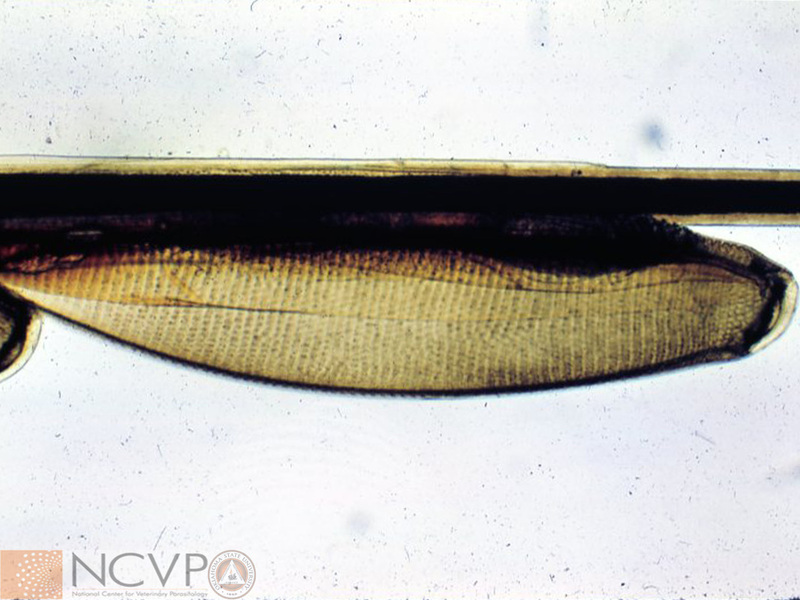 Its first two segments are distinctively short, while the terminal segment has a tooth like projection at its base. 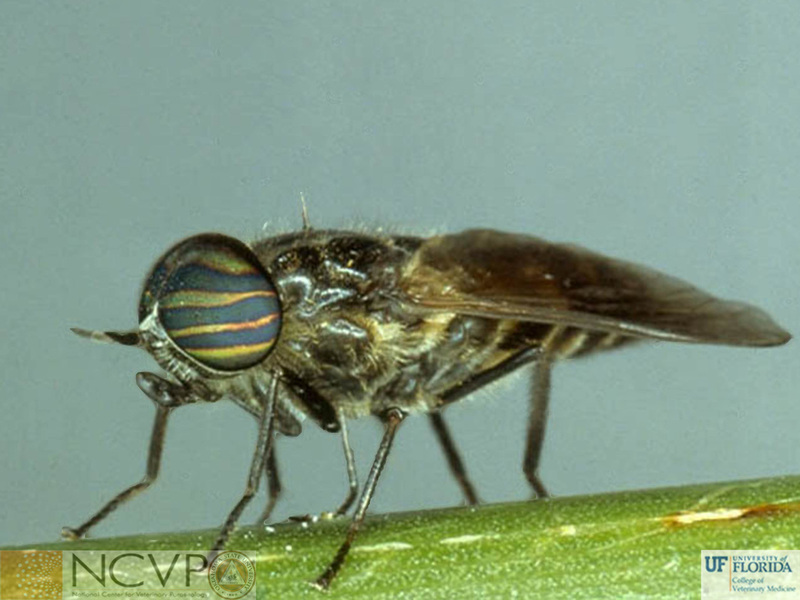 Known as the striped horse fly, Tabanus lineola is more commonly found in the eastern and southern United States, though it is not limited to this range. It's common for Tabanids to hold their wings horizontally when resting, as shown. A feeding female Tabanus melanocerus. Female Tabanids are well known blood-feeders but will also feed on honeydew and nectar as the males do. 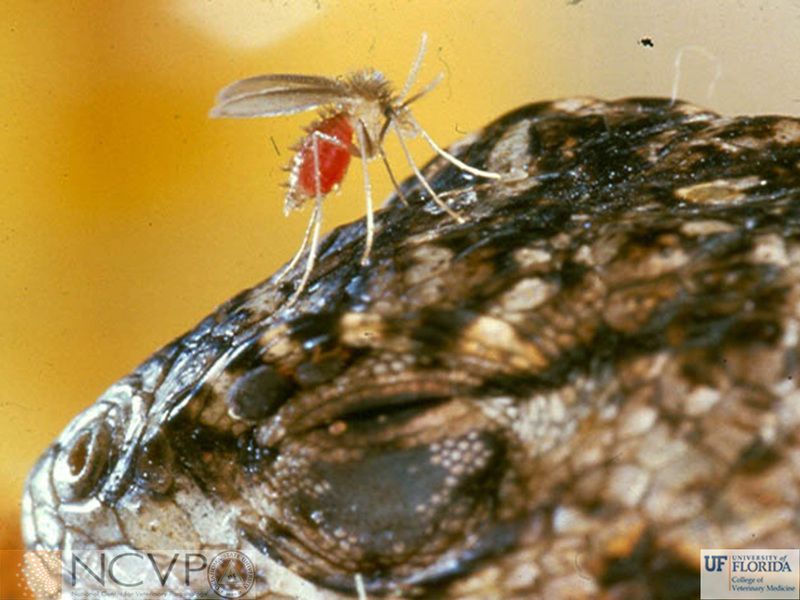 When biting a host, they cut the skin and lap up the blood that pools on the skin. This direct blood contact gives them the ability to act as a mechanical vector for many diseases. 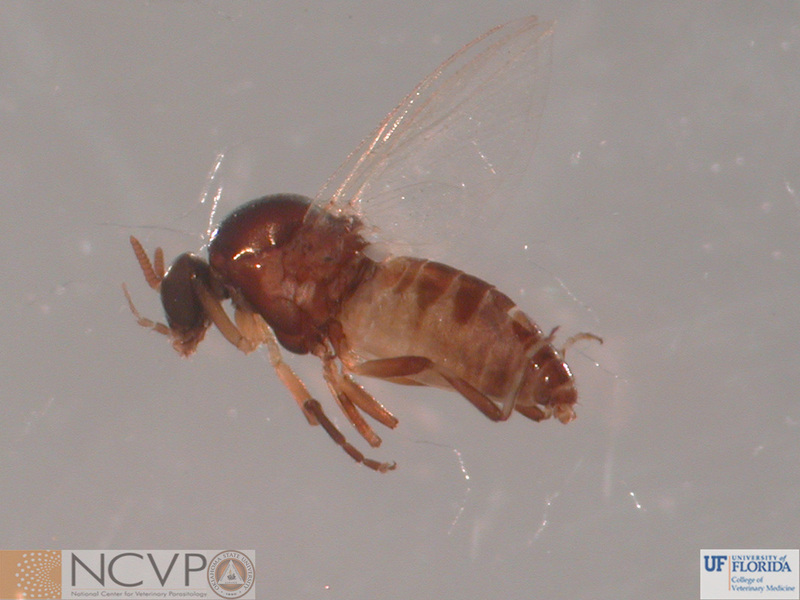 They also serve as biological vectors for Trypansosma theileri and Elaeophora schneideri. 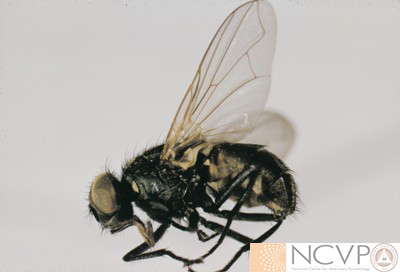 ​Simulium, also known as the "buffalo gnat," "black fly," or "humpback fly," are biting flies that swarm when they attack. 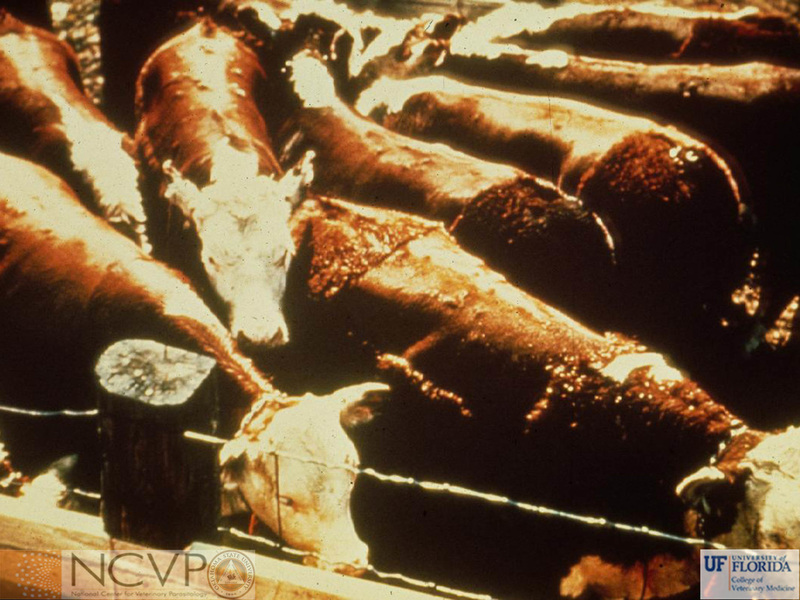 There are reports of Simulium attacks resulting in the death of livestock and wildlife as a primary cause. Simulium is also known to vector various viruses such as Eastern Equine Encephalitis and Vesicular Stomatitis, along with various protozoa and nematodes such as Leucocytozoon and Onchocerca, respectively. 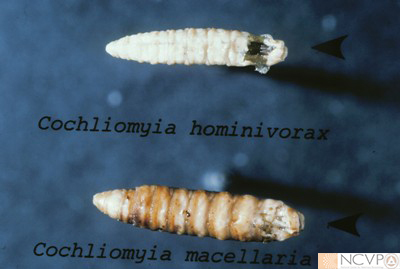 Simulium lay their eggs on stones or plants just below the surface of the water in running streams. The eggs hatch in 4 to 12 days and the larvae attach themselves to rocks by means of a posterior organ that is armed with small hooks. 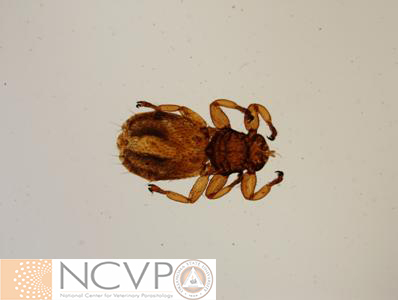 Their anterior is equiped with a pair of brush-like organs with which they trap and ingest other insects. 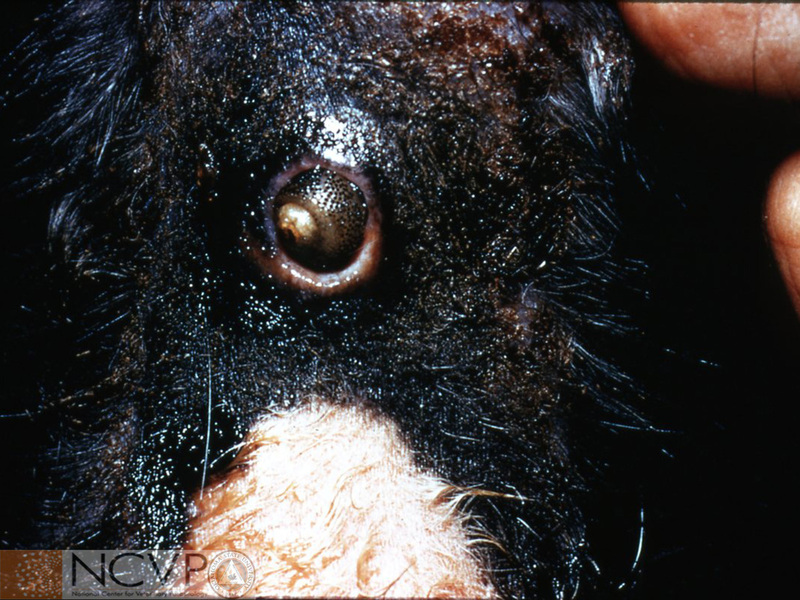 Post docking cutaneous myiasis in a lamb. Commonly known as "fly strike" or "fly blown" to producers. 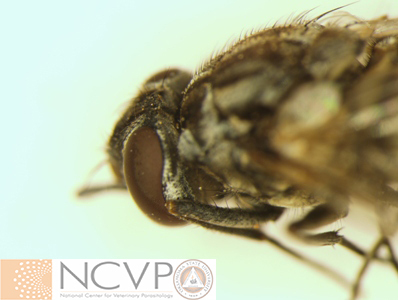 Possible species of facilitative myiasis-producing flies include; Musca domestica, Calliphora, Phaenicia, Lucilia, Phormia, Sarcophaga, and Chochliomyia macellaria. 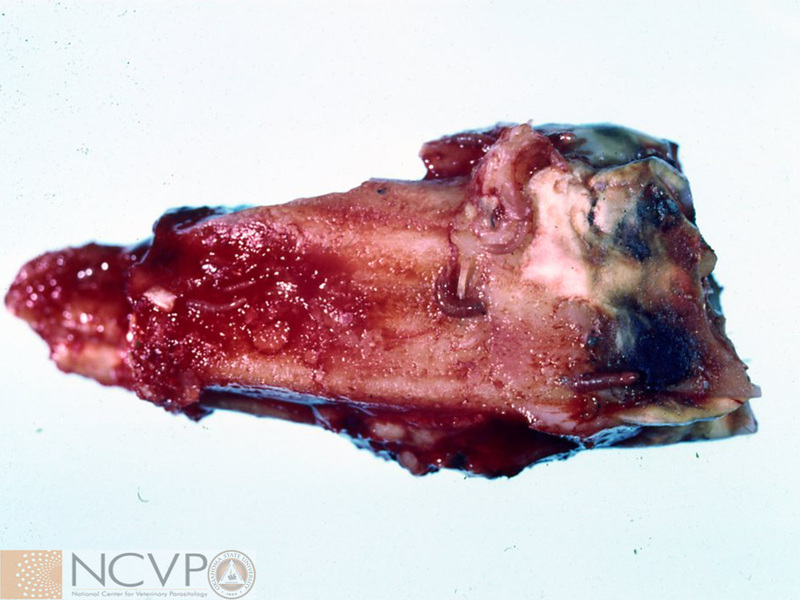 Cochliomyia hominovorax, primary screwworm, can be distinguished from Cochliomyia macellaria, secondary screwworm, by its pigmented tracheal trunks. Nasal bots of white-tailed deer, Cephenemyiacan be found in the retropharyngeal space. 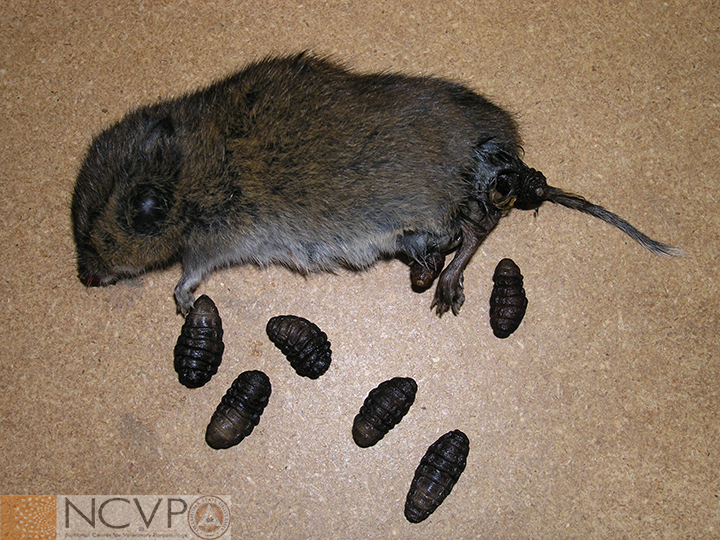 Severe infestation of Cuterebra in a vole. Adult Cuterebra deposit their eggs near the entrances of burrows belonging to potential hosts. ​Larval Cuterebra encysted in the neck of a cat. 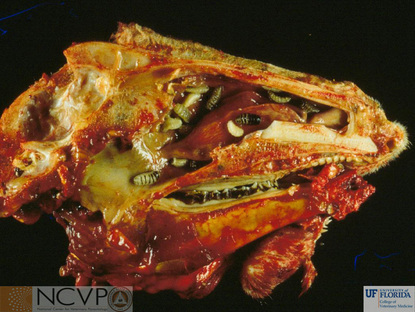 Infections of the cranial cavity of the cat has been reported as well as parasitic orchitis in the dog and cat, and dermal infections in humans. Extraction of Dermatobia hominis from the back of a bovine. 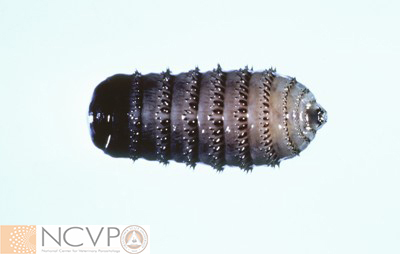 The posterior end of the larva may be seen protruding through the hole it has cut through the dermis. 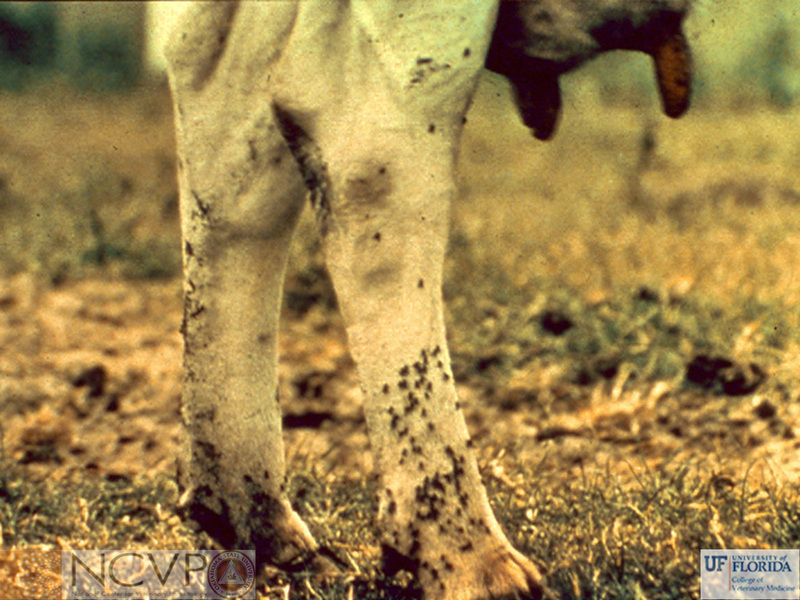 Dermatobia hominis may infect cattle, dogs, cats, sheep, rabbits, and other animals including humans. 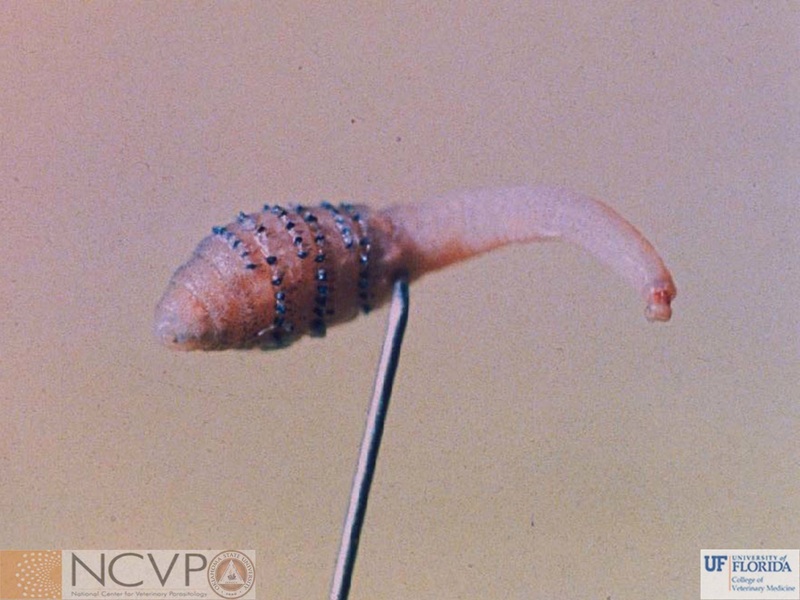 Larva of Dermatobia hominis. 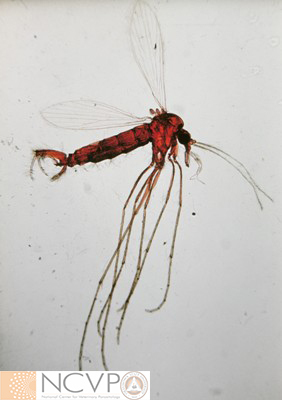 A member of the family Cuterebridae, Dermatobia hominis is found in tropical America, from Mexico to the Argentine. 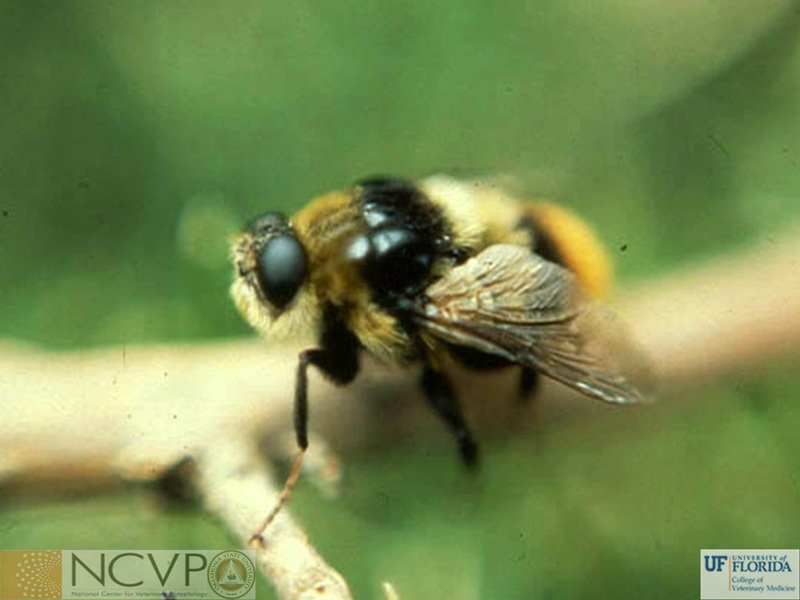 Adults lay eggs on the abdomens of biting flies which provide transportation as well as initial access into the dermis. Species of Gasterophilus can be differentiated according to patterns of spines on the bot larvae. 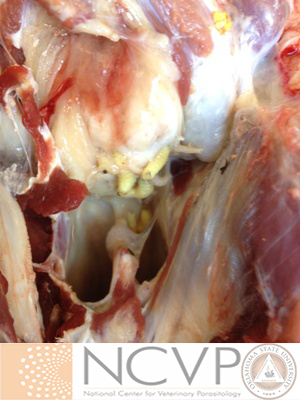 Migrating first stage larvae of Gasterophilus nasalis around the molar of a horse. 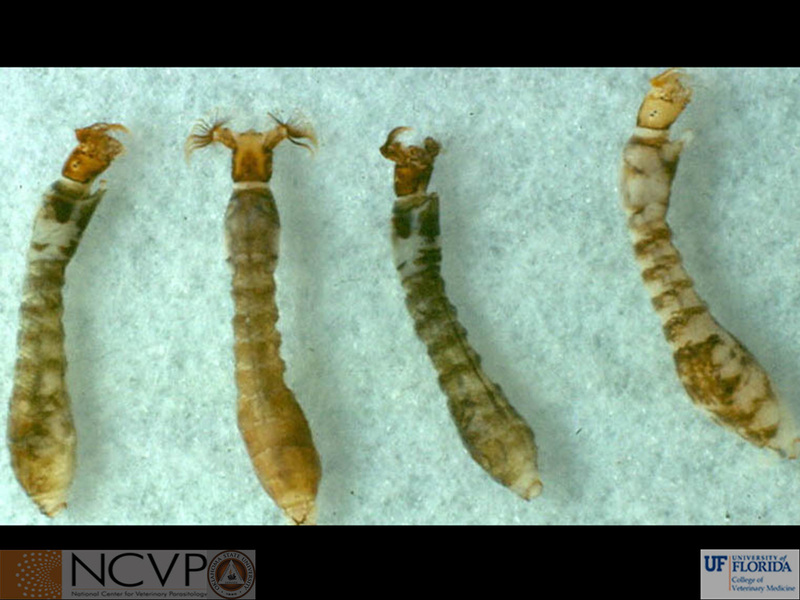 First stage larvae will migrate for approximately 28 days before molting and moving to the stomach. Egg of a Gasterophilus sp. on a horse hair. 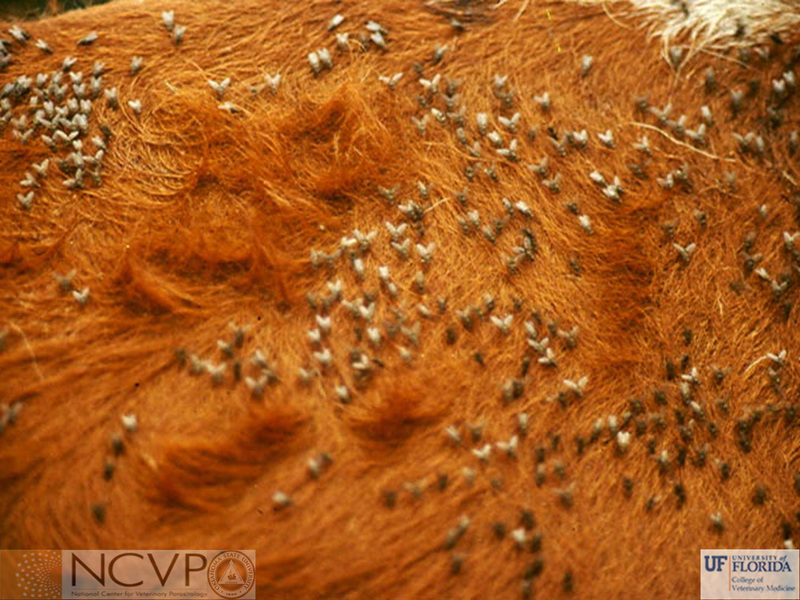 Horse bot flies can oviposit between 150 and 100 eggs on a horse's body, typically during the early summer months. 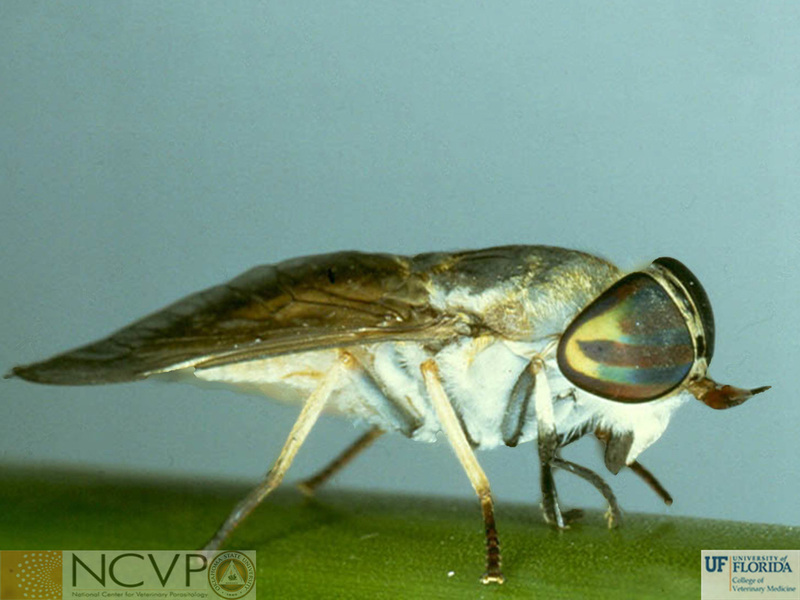 Adult Hypoderma, also known as the warble fly are non-feeding, as evident by their diminished mouth parts. Their adult life is short, usually less than a week, giving them only time to breed and oviposit. 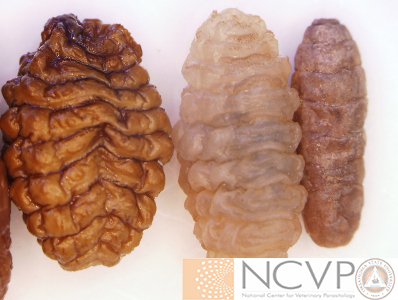 Nodules on the backs of cattle caused by encysted Hypoderma larvae, said to be in the, 'warble' stage. 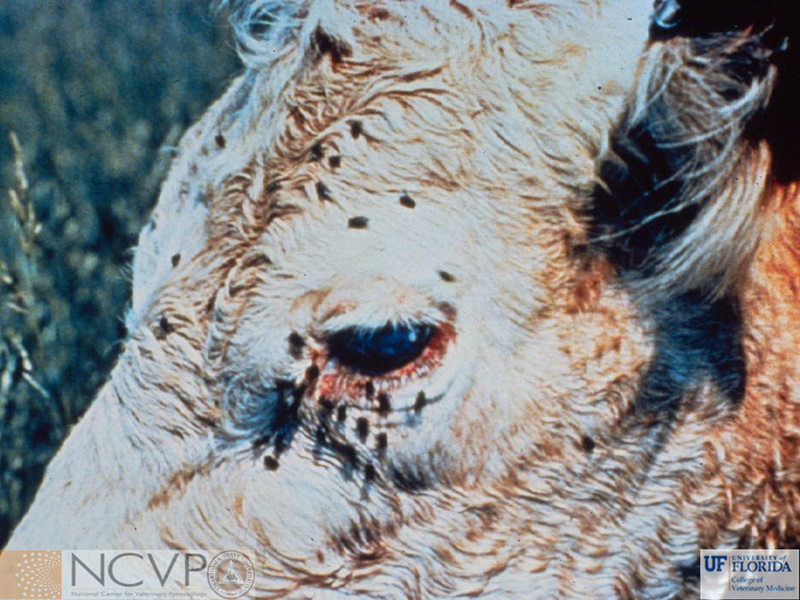 The larvae cut small holes or pores in the backs of cattle through which they respire. 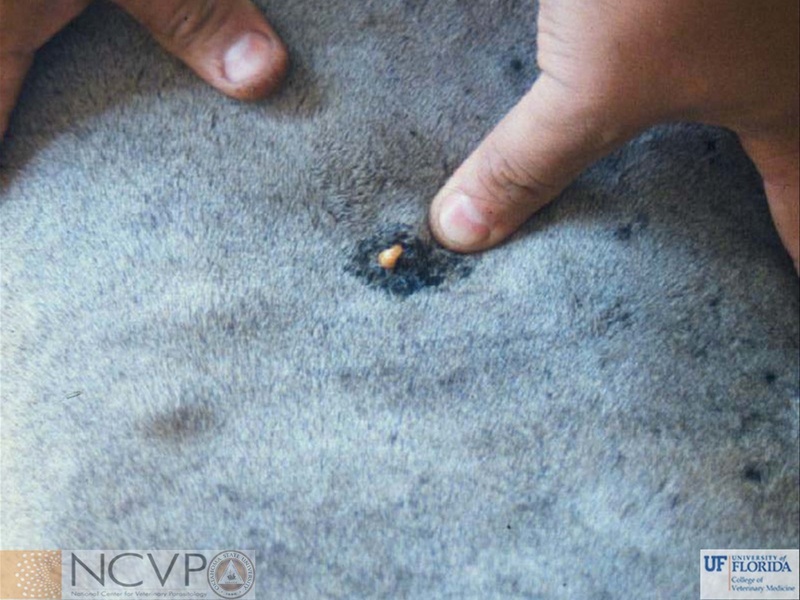 This stage lasts approximately 30 days before the larvae emerge through the pores and begin pupation on the ground. 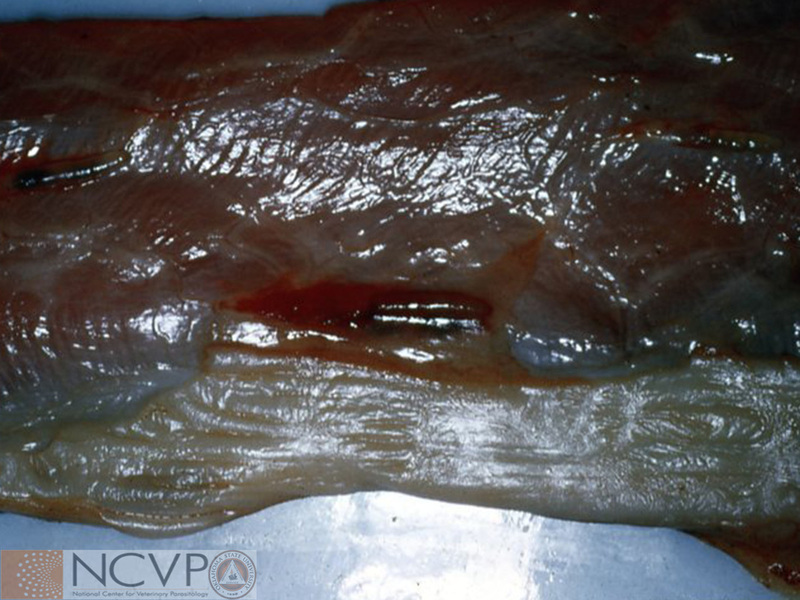 The third-instar of Hypoderma can be found in subcutaneous nodules in the backs of cattle. Migrating first stage larvae of Hypoderma lineatum found on necropsy of a bovine. 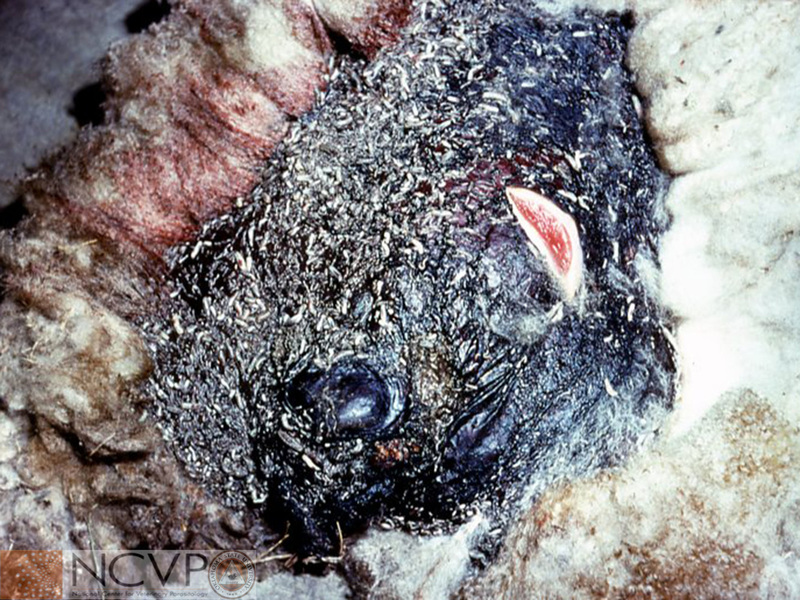 Adult female Hypoderma lineatum deposit their eggs below the hocks on the hair of cattle during the spring, the eggs hatch, larvae penetrate, and may be found around the esophagus during the winter. Oestrus ovis larvae in the nasal turbinates of a sheep head cross section. 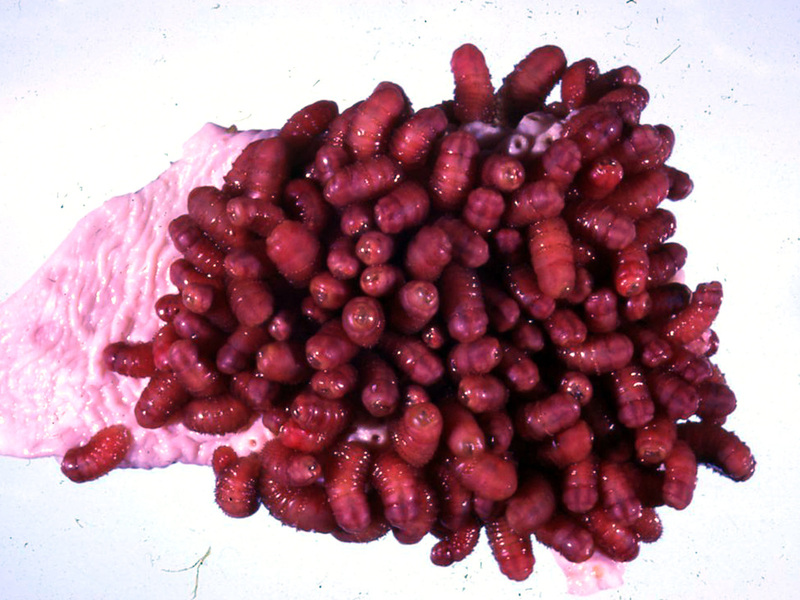 Though the adults do not feed on animals, Oestrus is still considered parasitic as its larvae feed solely off the bodily fluids of their host. "False gid" is a condition wherein the larvae erode the bone of the skull and damage the brain, causing neurologic signs. Melophagus ovinus is the sheep ked. 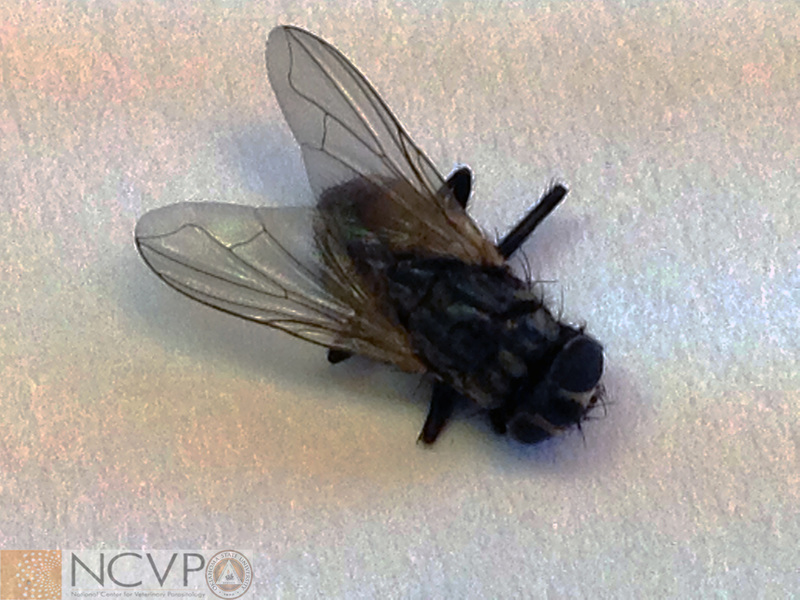 This wingless fly is most often confused for a louse and is sometime called the louse fly.